Las Vegas is NOT just a gambler’s haven. There is a multitude of activities 24 hours a day/night to keep the adrenaline going. I travel to Las Vegas three times a year and my husband and I are not what you would call gamblers. We play the penny slots and $5.00 blackjack tables. We set aside $150.00 in an envelope and that is our ‘loss’ money. I know, Las Vegas will not get rich on our investment! Winnings go in a separate envelope for an exquisite dining experience. Believe me when I say…”When I play and I have reached the point of doubling my money…off I go to the cashier box to claim my winnings. We don’t come home big winners but that is not why we go to Las Vegas. 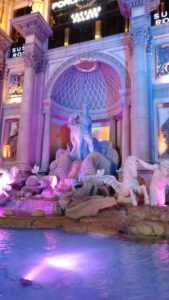 Here are my Top 10 Suggestions for Las Vegas. The Gambler. You will always find a slot or game table wherever you go in Vegas. Set you ‘loss’ limit and have fun. The Shopper. 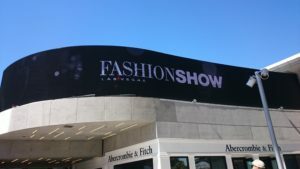 Find accommodations on the strip near the Fashion Mall on the Strip. Most large hotels/resorts also have shopping arcades. The Water Lover. 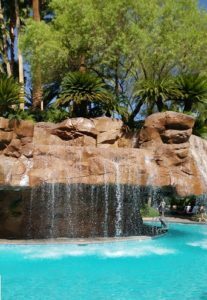 Check on-line for ‘resort pools Las Vegas’ and select your pool of choice. Be aware of the season you are going. Most pools are outdoors and in the cold are not open. The Buffet Guru. Take your pick…breakfast, lunch, dinner. Check for specials or coupon books. Some buffets have discounts. The Walker. Wear broken-in, comfortable shoes, slacks or shorts and a top. No shoes…no inside! Leave the high heels and stilettos at home or wear only when going out to dinner. The Luxury Traveler. Take a limousine from the airport to your hotel. In the evening, have dinner reservations at a hotel on the strip, get all dressed up for an evening out and ride in style. 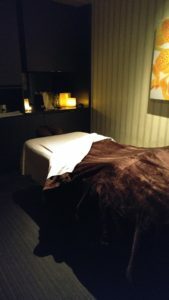 The Spa Experience. 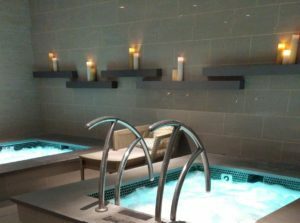 All of the large hotels have gorgeous, luxurious spas to relax and unwind. 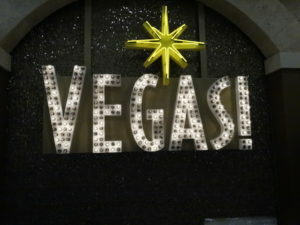 Try the Mirage, Ceasar’s Palace, Venetian, Wynn or Mandalay Bay to name a few. The “Hotel” Experience. Check websites for hotel room discounts or call the hotel and ask for their specials. Join the Members Clubs like MLife and others online before you go. At Check-In be friendly, upbeat and smile. When they are assigning your room ask if there is a possibility for an upgrade. A smile can do wonders. Take the monorail for a day or two. Your feet will thank you. Use the room safe. Do not bring expensive jewelry or anything you would want to lose. 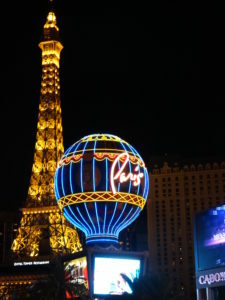 Here are my Top 10 Activities for enjoying Las Vegas. Walk thru the large hotels. 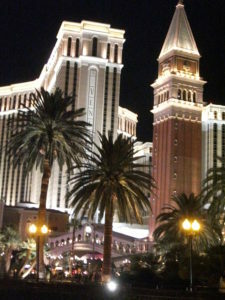 There are beautiful gardens (Bellagio), Dolphins and Animals (Mirage), Grand Buffets (Wynn +), Shopping and Show Arcades (Ceasar’s Palace..The Forum), a replica of Venice with gondolas, opera singers, mimes, restaurants and shopping (Venetian), Medieval life (Escaliber), outdoor beach (Mandalay Bay) or chandelier lounge (Aria). Take your time and walk through each resort. Everyone is different. 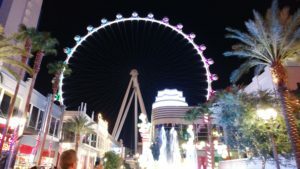 Take the Linq, a very slow moving ‘ferris wheel’ with glass enclosed pods. Ride during the day or at night for the ultimate night view of the strip. You can also have the bar experience while riding. The Mirage has a free nightly show featuring their iconic volcano. An Ahhh, wow, moment. 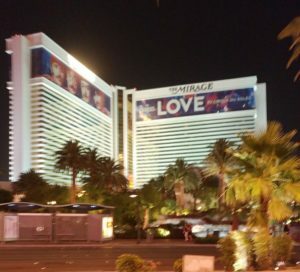 Stake out your position on the sidewalk in front of the Mirage entrance for the best video, pic views. 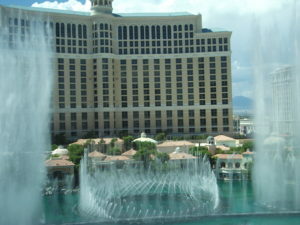 The Bellagio has a free nightly show of dancing waters. An Ahhh, wow, moment. Center front on the sidewalk. The Paris has an elevator which takes you to the top. An excellent evening meal overlooking the strip is ideal for a romantic dining experience. 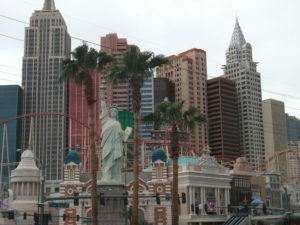 New York, New York is a touring hotel with restaurants, cafe’s and a fast-moving roller-coaster. Circus Circus has rides and entertainment for the young and old. The Stratosphere is a tall needle pointed hotel with a roller-coaster at the top. The atmosphere for an evening drink or meal is breathtaking. 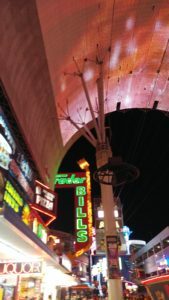 Fremont Street, downtown Las Vegas is a long avenue with casinos and shops on two sides and above an evening light show on the arched ceiling. You can zip line above visitors in the middle of the street. Entertainment of all types are seen on the stages or in the street. Beware with children..some performers are scantily clothed! Cirque du Soleil. Presently six different productions are showing. LOVE by the Beatles at the Mirage in the newest production. 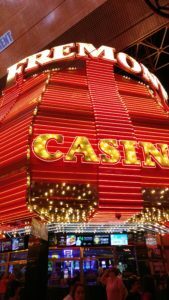 Here are my TOP 10 TIPS to prepare for the Las Vegas Experience. Do your research before you go. Google..www.LasVegas.com. This website will tell you everything you need to know with links to Hotels, Shows, Restaurants and Events. Spend time finding the hotel that you can explore and adore the surroundings. Every hotel is different and room prices fluctuate according to convention seasons. Attending a convention? 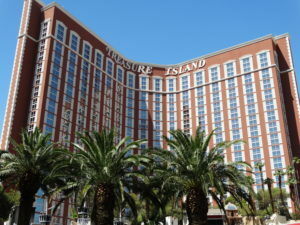 Most offer room discounts at the convention site hotel. Also, check out the “Conventions Schedules” to see which hotels will be hosting large expos. Unless you are attending a convention, look at alternative accommodations. The wait time for elevators will be long. Check the weather report for the days you will be in Las Vegas. Summer can be in the 100’s (extremely hot), Fall and Winter seasons cool (will need slacks and jacket). Always carry an umbrella. just in case. Bring sunglasses, swimsuit and cover and medications. There are Walgreens and CVS pharmacies on the strip. Buy your sunscreen and other necessities there. This saves room in your suitcase. Watch your purses, cameras and wallets! Be aware of your surroundings. Large groups of people gather at stop lights and it is crowded. You do not need a car. Some hotels are now charging for parking. 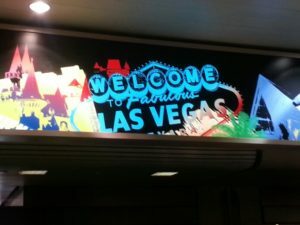 Take a shuttle or cab from the airport, use the monorail or buses on the strip to downtown. There are tours which go outside the city and it may be a money saver to tour rather than rent a car and pay all the fees and taxes that are incurred. Don’t forget the hop on-off bus passes. There are kiosks of half-price tickets for shows and dinners that open at 10:00 a.m. Check your free city map for locations on the strip. Get a Players Card at each hotel. Place them on a key chain. You place the card in the slot machine or on the table to collect points. If you play long enough you may get a ‘comp’. Room service can get pricey. Stay out of the mini bars! Buy your drinks, water (stay hydrated), quick snacks or sandwiches at Walgreens. A cheap throw away cooler can save you money and the ice at the hotels is free! Final Thoughts of having a great time in Las Vegas. Plan ahead and only visit a Wedding Chapel if you are sober, have previously made all your preparations, have any necessary paperwork with you and you have spent time selecting the perfect ring! In other words, this is not a spur of the moment commitment.